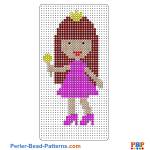 Here you can download our perler bead patterns for free. All patterns are in PDF format and can be downloaded directly to your computer. After downloading a patern you need just to print it out and you are ready to go. 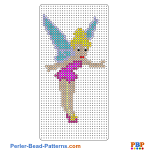 Each pattern has the real dimensions of the pegboard (from Perler or Hama), so that you can put them under a transparent pegboard. Due to the differencens, that different printers may have, it could be possible that the printed colors differ from those shown in the PDF template. Important advice: be careful at the moment of printing your patterns, deactivate any scaling function of your printer, otherwise the size of the pattern wont match with the one of the pegboard. Video games Tv & Cartoons Animals Vehicles Brands & Internet Children's Books Decoration Food Fantasy Holidays & Events Sports Everything else!